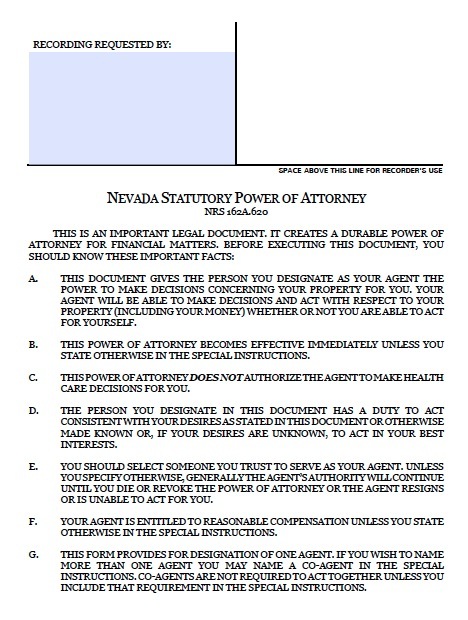 Otherwise known as “Statutory Form Power of Attorney”, allows for the limited or unrestricted use to act in the presence of another for any type of monetary situation. Alternatively, you can indicate that the agent may act for you in only one of these areas or any combination. The agent may not do certain other acts, unless you specifically authorize them on a separate portion of the form. These include changing or designating your beneficiary, making a gift on your behalf, making or changing trusts, and refusing an interest in property.